It’s happened to all of us at some point. Your eyelid is twitching uncontrollably and you don’t know why. While this can be annoying, it’s not usually a sign of anything serious. You might feel very self conscious when it happens, but the truth is the movements are so quick that people around you are unlikely to notice it’s even happening. Most cases of eye twitching are thought to be caused by lifestyle factors, many of which we can work on if needed. Let’s take a look at some of the more common reasons for eye twitching. When we’re under stress, our bodies produce a hormone called epinephrine, known as the ‘fight or flight’ hormone. This prepares our body to take action to deal with whatever situation is thrown at us. It’s a process that can involve twitching of muscles or nerves all over the body, including the eyelids. Of course, it’s impractical to suggest avoiding stress entirely, as it’s a fact of everyday life. However, you can take steps to reduce the amount of stress you’re under, such as improving your work-life balance and spending more time on your hobbies. Studies have shown a correlation between poor sleep and eye twitching. However, none have yet identified why this is the case. We know there’s a link, we’re just not sure what it is. Until we have our answers, the solution here is fairly obvious. Get more sleep! Drinking more than the recommended amount of alcohol is another known cause of eye twitching. It puts strain on the body and affects the quality of your sleep, so don’t be surprised to find your eyelids flickering after a night in the pub. There are all sorts of reasons to moderate your alcohol intake, and now you can add eye twitching to the list. Caffeine is a stimulant that makes your muscles and nerves more sensitive and reactive to your environment. This makes it more likely that you’ll experience the occasional twitch, which can affect your eyelids. If you consume a lot of coffee, tea, soft drinks and chocolate, it could be worth lowering your intake and seeing if this improves your eye twitch. Straining to see makes your eyes work harder than normal. This is a form of stress, and as such can lead to your eyelids twitching. If you think sight problems may be to blame for your twitchy eye, you should visit an optician to find out if you need glasses, or consider whether your current glasses or contact lenses are right for you. Issues with your vision can also occur if your job involves sitting in front of a computer all day, so consider looking up from your desk every once in awhile. A shared symptom of problems such as insomnia, stress and a high caffeine or alcohol intake is that they each leave your eyes very dry. Without the moisture they require to function properly, your eyelids may be more susceptible than normal to twitching. While dealing with these underlying causes should be your top priority, you can also ask a doctor about eye drops that will help get some moisture back into your eyes. If you find your eyes are twitching and watering, your allergies may be to blame. For example, it’s a natural reaction to rub your eyes if they feel itchy during a bout of hay fever. Unfortunately, this releases histamine (the chemical compound your body releases to fight infection) into your tears, and evidence suggests this can contribute to eye twitching. You can combat this by taking antihistamines to suppress your body’s natural reaction. If your diet is lacking nutrients such as vitamin B12 and vitamin D, your body doesn’t quite function as it should. Eye twitches are one of the many symptoms you might notice, and it won’t surprise you that the best fix here is to get more of these nutrients into your diet. Try consuming more fish, shellfish and dairy products, while if you’re vegan or vegetarian, there are many products available that are fortified with both of these vitamins, such as almond milk or soy milk. Vitamin D is also famously found in sunlight, so it might help to get out and about a bit more. If you’re worried about the noises coming from your knee, our GPs will be able to give you peace of mind. Book an appointment at a time to suit you and use your smartphone, tablet or desktop device to chat to a doctor about your symptoms. Is eye-twitching more common in pregnant women? Visit any pregnancy forum and you’ll likely find a thread full of expectant mums wondering why their eyelids keep twitching during pregnancy. Given what we’ve learned so far, it should come as no surprise to learn that this is a common problem for pregnant women. Pregnancy can be a stressful time, particularly if it’s your first baby and you don’t really know what to expect, while we probably don’t need to point out that sleeping can also be a challenge. Eye twitching seems to be an issue that can strike at any time during pregnancy. While it can be a frustrating distraction, it’s almost always temporary. However, if you’re at all concerned, you should speak to a doctor. Should you see a doctor if your eye is twitching every day? If your eye twitch is happening every day and has lasted for longer than a couple of weeks, it’s worth checking in with a doctor to establish why it’s happening. They’ll ask you some questions that will determine if there are any lifestyle factors that might be causing your twitch, or if further tests are needed. There are a couple of things to look out for that might suggests your eye twitch is a sign of something more serious. If the twitch spreads from your eye to areas lower down your face and neck, you should speak to a doctor as soon as possible. 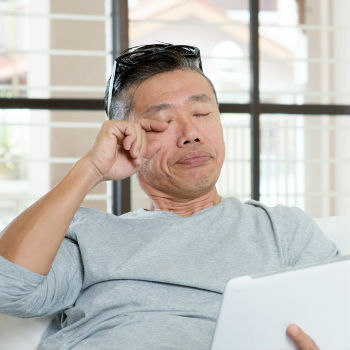 If your twitch becomes an involuntary wink or blink (in other words, if your eye closes completely instead of just twitching), this could be a sign of a condition known as blepharospasm. While twitching can be annoying, blepharospasm can really get in the way of your everyday life. Fortunately, there are treatments available, so ask a doctor about these. If you’re worried about your eye twitching, our doctors are here seven days a week. You can see an experienced GP at a time to suit you, from the comfort of your own home, and get the peace of mind you need.